Holdem Manager is among the very best online poker tracking software tools available and the recent launch of Holdem Manager 2 has further cemented this poker tool as a leader in it’s field, the poker software is used by many pros. 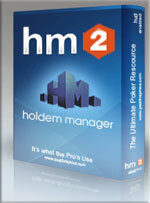 Holdem Manager 2 – HM2 is a revamped version of the older Holdem Manager it provides a new designed user friendly interface and HUD with access to all data and statistics in real time. It provides much faster hand imports up to three times faster than previous versions with full reporting of both cash game and tournament players along with data full graphs and stat views. Use Holdem Manager 2 to track all of your poker hands, your profits and loss rates with detailed graphs and analytical reports of your both cash games and tournament sessions with the ability to combine data from several poker rooms via hand history. Using the data that HM2 provides players can easily use it to their advantage to exploit weaknesses that are identified by the statistics that Holdem Manager provides. The poker software features the holdem-manager HUD which easily attaches to the poker table of your chosen room then provides real time stats and detailed information about all the players at your table based on their play. Hold’em Manager 2 is an advanced analytical poker tracking tool suitable for online poker players of all types from recreational players right up to the top pros.The software is legal and allowed at any of the many supported online poker rooms.The edge that Holdem manager poker tool provides over your competition helps you to maximize your profits from sessions played at online poker tables. 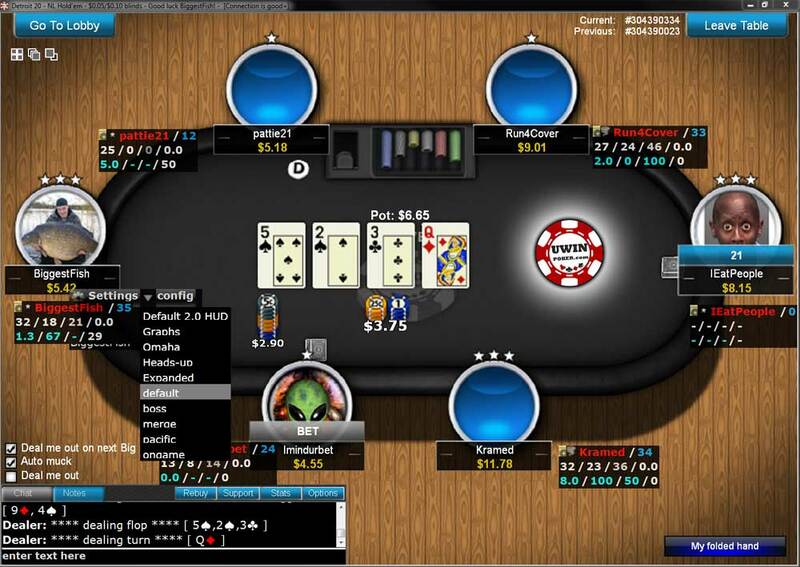 “I use Hold’em and Omaha Manager to track and analyze my play. Anyone who is serious about poker will benefit from using HM.“ – Brian Hastings well known poker pro. Holdem Manager 2 supports most popular online poker room software. 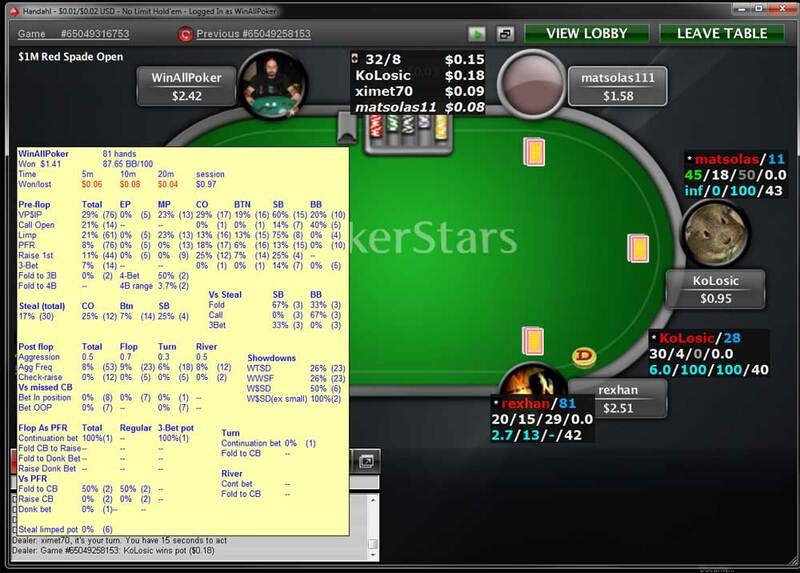 PokerStars Zoom supported with HUD. Tournament and Cash games reports, graphs and statistics. Allows third party plugins to attach to the poker tool software providing additional functionality and features. HM2 provides preset HUD’s, the preset settings make it easier to implement the HUD with no additional configuring needed. Fast import past hand histories for detailed hand analysis of your play. Poker Hand Replayer view past hands played back with hole cards exposed. Ability to sync to computers hand histories together as one player which can be useful for those playing from a laptop and desktop. All reports are fully customize with many useful filters. Poker HUD real time stats attaches to most online poker tables. Statistics and opponents statistics are calculated real time while you play, the Hold’em Manager Two HUD attaches to your current table and updates stats during play. Hovering your mouse over your opponents provides a detailed break down of their play based on the number of hands they have played while you were seated at the table with them. Holdem Manager 2 software provides advanced player tracking abilities in the poker tracking software with options to customize the display of statistics and data collected on your rivals. VPIP% – Voluntarily put money into the pot percentage. PFR% – Pre Flop Raise percentage. 3Bet% – 3 Bet percentage. FvFCB – Fold vs Flop C-Bet. F_BB – Fold Big Blind vs Steal. FCB% – Flop C-Bet percentage. Import your past hand histories and sessions to get detailed statistics of your cash games and tournament play. Hold’em manager displays graphs of your earnings, All-in EV, Showdown profit and rakeback when applicable. The poker software finds any leaks that may be present in your game and suggests which aspects can be improved based on the imported data. The following rooms are supported by Holdem Manager 2 and usage of the poker software at these rooms is allowed. Holdem Manager 2 comes with a free 30 day trial for those wanting to explore and experiment with all the options and features the poker tracking software offers. Several licensing options exist Hold’em Manager 2 Pro is the full version of the software it covers the license for all holdem games at any stake level. Hold’em Manager Pro Combo includes Hold’em Manager 2 & Omaha Manager 2 for all limit stakes. Recreational players can get the Holdem-Manager 2 Small Stakes Version which includes the same features but limited to micro and low stakes holdem poker games. Holdem Manager 2 offers users the opportunity to get the HM2 suite of poker tools for free by awarding free credits towards the purchase of software available on their site. The credits come in either $75 or $100 units with a wide range of poker rooms to choose from all of which require the creation of a new poker account and deposit at a suggested room once a points criteria is reached the free credits are made available for use on any Holdem Manager products. The full listing of rooms and how to get Hold’em Manager for free. The Holdem Manager Mobile App can be used to watch poker tutorial videos, replay hands and share your favorite hands on social networks using your iPhone, iPad or iTouch. Android devices to be added shortly. Holdem Manager poker tool seamlessly integrates third party plugins for added features and ability. TableNinja for PokerStars, SNG Wizard, TableScanner, TiltBreaker and LeakBuster many of which offer a free trial version to test out in the Holdem Manager 2 software.